LOS ANGELES — On a recent Wednesday, a pregnant woman in yoga attire, a young bearded man and two 20-somethings with crystals around their necks settled themselves onto the floor of the Temple of Intuition next to the House of Intuition, a self-described “metaphysical shop” on a hill in the Silver Lake neighborhood here. The intimate studio space was outfitted with geometric statues and vibrant pillows. At the front of the room stood Dominic Moore, 47, before a blanket covered with a collection of crystals, bowls, chimes, tuning forks and a gong. These are the tools Mr. Moore uses to conduct a weekly ritual known as a “sound bath,” for which he charges $10 per participant. “Find a space that calls out to you,” he told the half-dozen people assembled, who were reclining on yoga mats or amethyst-hued cushions. He instructed his charges to relax and let the transcendental tones he was about to play wash over them; part of the challenge was the cacophony of noise from nearby Sunset Boulevard. “Some sounds may be overwhelming,” Mr. Moore said. 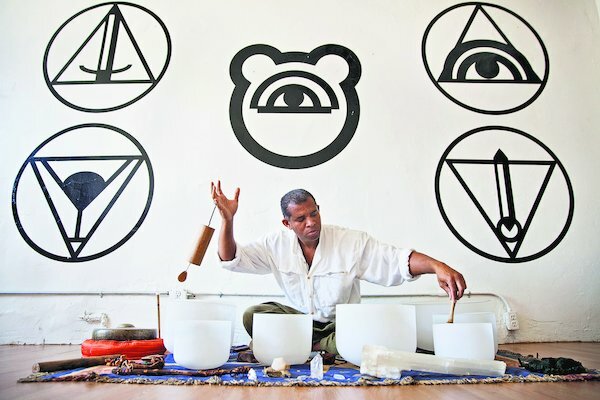 Dominic Moore conducting a “sound bath” at the House of Intuition in Los Angeles. The “bathers” closed their eyes as he struck a bowl to begin the 60-minute session, which he said is meant to put an individual’s body in harmony with the soundwaves. His aim was for the vibrations to bring peace and rest and enable meditation. Once found only at New Age retreats or the white-domed Integratron in the Mojave Desert, sound baths are now offered all over Southern California. Celebrities such as Robert Downey Jr., Charlize Theron, Laurence Fishburne and Robert Trujillo of Metallica have participated. Sound healers, sometimes called “sounders,” say the vibrations can relax brain-wave patterns, lower heart rate, reduce stress and pain, relieve anxiety and sometimes help with post-traumatic stress disorder symptoms. Dr. Helen Lavretsky, a psychiatry professor at the Semel Institute for Neuroscience and Human Behavior at the Geffen School of Medicine at U.C.L.A., and a Kundalini yoga instructor, has practiced sound meditation for 11 years, using it for older adults with memory problems, among others. She said that participants will often fall into a state of profound relaxation and wake up refreshed. “Deep mental and physical relaxation would decrease sympathetic and will increase parasympathetic autonomic nervous system tone and response, thus decreasing stress response,” she said, while warning that prolonged loud sounds could result in temporary or chronic ringing in the ears (tinnitus), even hearing loss. Jamie Ford, 38, has been leading sound baths for almost a decade in Southern California but said it wasn’t until the last few years that people have shown more interest. This spring Ms. Ford opened her own studio devoted entirely to sound baths, called The Sound Space, in the Eagle Rock neighborhood here. When Ms. Ford originally contacted people and told them what she does, she said, they were skeptical about what they called a “hippie” ritual. “Then over time people have become more familiar,” Ms. Ford said. She credits the growing acceptance of sound baths to the popularity of the Integratron, near Joshua Tree, Calif., with young people rediscovering a midcentury aesthetic. The parabolic structure was built in 1959 by the aeronautical engineer George Van Tassel, who believed that aliens had shown him how to do it. 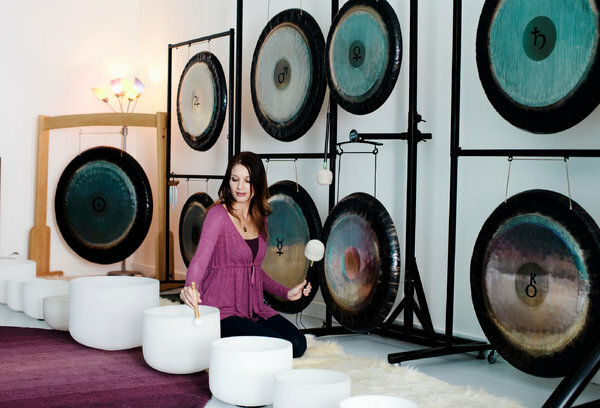 Jamie Ford shows the instruments she uses during a sound bath at The Sound Space, her studio in Eagle Rock, Calif.
Now owned by sisters Joanne, Nancy and Patty Karl, the Integratron has become a destination for sound baths and other methods of rejuvenation. Its history and sonic sessions have drawn the Travel Channel’s Anthony Bourdain, as well as thousands of other visitors. The increasingly mainstream yoga community has helped spread awareness of sound baths, too. Ms. Ford sometimes conducts seven sound baths a week, often at a yoga studio or her own space. “My goal with sound baths is to make it available to anybody whether they practice yoga or meditation or not,” she said. “It can be so great for stress.” It’s a time when “we are not on our phones. We are there just being,” she added. Each sound bath is different, starting with the cost, which can range from $10 at the Temple of Intuition to $250 (for one to four people) at the Integratron. Maybe because Mr. Moore is a New York transplant, his sessions at the Temple of Intuition tend to combine the clamor of the city with his own instruments. Ms. Ford’s baths, $20 to $25, are quiet with dim lighting and are centered around the expansive sound from her 10 gongs. Then there are the meditative sessions conducted by Guy Douglas. He came to California by way of Connecticut and has been dubbed “the gong guy.” Mr. Douglas, 40, conducts Saturday sessions for a “$20 energy exchange” at Unplug Meditation, a sleek, modern studio in Santa Monica, Calif., devoted to meditation, bringing in 40 to 50 people each week. “Basically, what I do is have a sun gong and an earth gong in the room,” he said. “The earth gong is vibrating at 432 hertz, and the sun gong is 439 hertz, and I have everyone face their head towards the sun gong and their feet at the earth.” This creates an intensive envelope of sound where bathers feel as if they are inside the vibrations. Some sound baths can leave individuals feeling relaxed, others energized. Back at Mr. Moore’s session at the Temple of Intuition, the bathers lay still, their bodies quietly vibrating. After several minutes they began to stir. One, Brandon Alter, said he had been coming to Mr. Moore’s sessions for two years. “A few weeks after I started coming, I quit smoking,” Mr. Alter said. “There was something about hearing the bowls that helped me stay with it.” One of the pregnant bathers, who identified herself as Jenny G. and a “seeker,” said she heard that the sonic vibrations are a good way to connect to her baby on a cellular level. “Whatever it is you want to get out of it, you’ll get out of it,” Jenny said. A version of this article appears in print on August 16, 2015, on page ST10 of the New York edition with the headline: From Metaphysical to Mainstream. Join SOUND UNIVERSE at HEART MIND BODY FESTIVAL April 2014! Congratulations to Sound Universe's Canada branch Grand Opening 2014! Martha Birkett's lifelong caring attitude has morphed into a career of working with many different healing modalities. 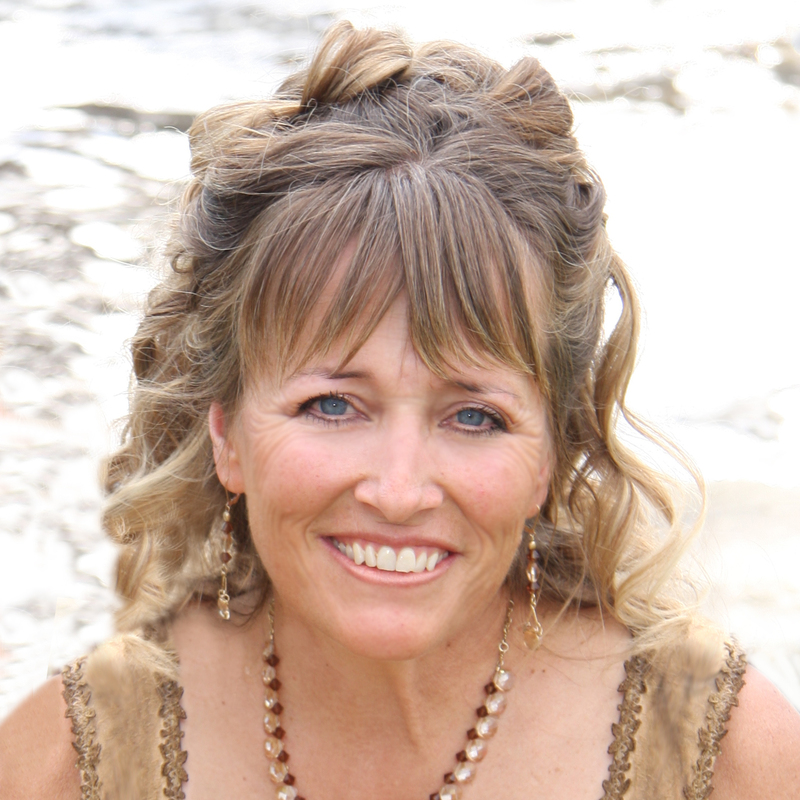 One of her greatest passions is vibrational medicine and the ancient art of sound healing. She incorporates her voice, music, tuning forks and Alchemy Crystal Singing Bowls (Crystal Tones) into her sessions and workshops at her Centre and abroad. Martha now holds the largest display of the Alchemy Crystal Bowls in Canada and distributes them from The Amaryllis Centre For Healing in Cochrane, Alberta. New Bowls for the New Year! Look what the Festive Season brought our way! New additions to the Crystal Bowl Family & a Quartz Pyramid and Octahedron! We are extremely excited and looking forward to sharing these Lovelies with you. An array of sets specially put together by Yantara -Aurora Angels.. Blue Magnetic Night..DNA Repatterning and More~ Happy Holidays !! Exciting news from the month of November has come! Recently, Yantara Jiro returned to Salt Lake City in Utah to personally select a range of magnificent bowls for our clients. Each bowl embodies their own unique consciousness and intelligence and they too provide guidance on whom they will choose to return and be with.